What are you working on? » "Make her a belt!!" This is one of the two projects on my workbench. 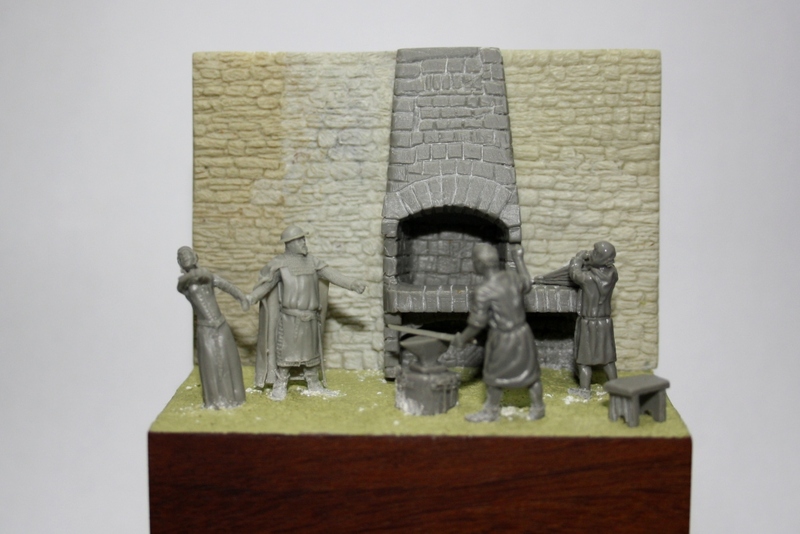 The figures are a mix from 3 sets from Valdemar's range and the wall scratchbuilt using MS. It's the final set up of the scene after some brainstorming with my clubmates at our modelling club. It tells the story (or at least I hope!) of a crusader taking (with force) his wife or mistress to the blacksmith for a chastity belt before he leaves for the Holy Land. RE: "Make her a belt!!" Great , you really make your Dios with perfect Atmosphere . Thank you all for your kind comments. Hope to start painting soon. Nice little set up. I look forward to it being painted. It could also be that she is being taken to the smith to have a tooth pulled...they used to do that as a "sideline" to making horseshoes etc. 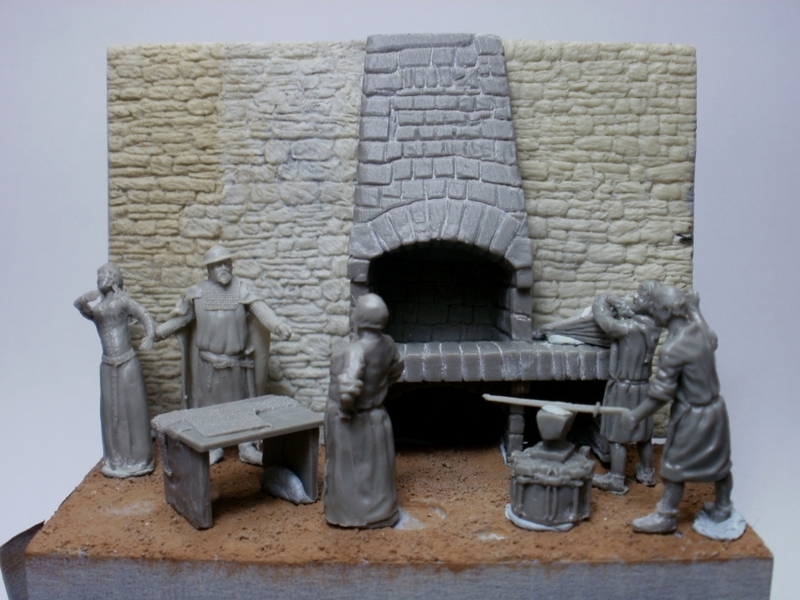 This will be a nice diorama and I like the idea with the man dragging his wife/daughter to the blacksmith to have him make her a belt. I personally do not think that there need more figures in this diorama. Changed the whole setting. Now the smith's wife is the main character, dealing with the knight while her husband is busy. I will try this one and see what come's out of it. Yes! It looks like smith's wife stop working with chain mail. And have acquired the belt. And saying "well here it is"
i would have something at top of the wall like wall plant. Or beams for the roof.